The art work and shared thoughts of Debra Corbett. A: I was always a creative and imaginative child. I’m originally from New Jersey and grew up in a family that exposed us to the arts. I have fond memories of family outings to the Metropolitan Museum, the Guggenheim, the Frick, the Cloisters, etc., in NYC. All these influences fostered a love for art at an early stage. A true love for and observation of nature holds the most power in terms of the direction my work is taking now. I was a much more traditional landscape painter in the past. A: I am a graduate of Seton Hall University but consider most of my art training to have happened after my children grew up and I had time to take classes at the DeCordova Museum and at workshops with well-known painters. Q: What is your current work about? What are you trying to explore and how has that evolved since you started? A: For several years I was a jewelry designer and had a very successful faux painting business which had a big influence on my current approach to painting and helped me find my “voice” for the canvas. I use acrylic paints, plaster, powdered pigments, glazes, and various other mediums. I have put more traditional and representational work aside for now and am simply inspired to create an interesting surface for people to explore. 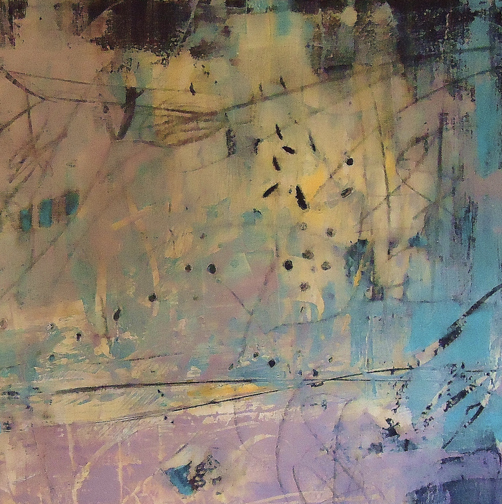 Through texture and color layering I invite the viewer to come to their own conclusion and interpretation. For me this is one of the most thrilling parts of working abstractly… to have no preconceived idea and just let the painting evolve on its own. Q: Who are your favorite contemporary artists? A: I think my all-time favorite painter is John Singer Sargent. For me, he is a genius in brushwork, composition, and color. He never fails to delight me. I love the work of Marcia Myers, Helen Frankenthaller, Mark Rothko, and Robert Motherwell. I’m generally attracted to strong expressive surface work and bold markings. Q: Is your work on display at any galleries? 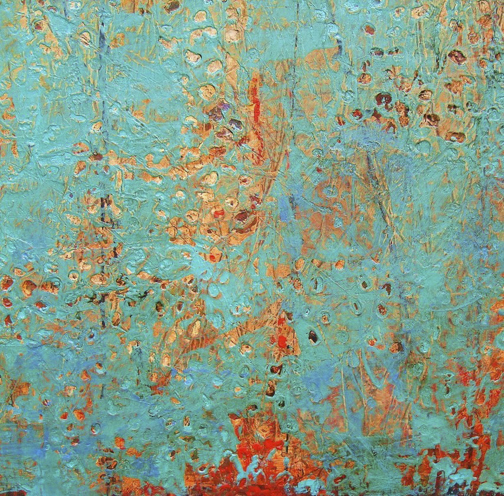 A: I am represented by Ventana Fine Art in Santa Fe, NM, and the Marshall-LeKAE Gallery in Scottsdale, Az. Locally, I show through the Hourglass in Melrose, the Cambridge Art Association, and in an online forum called UGallery. I pinch myself all the time to remind me how lucky I am to be with all of them. Q: What do you do when not working on art? A: This question has to be answered by saying that I am always “working on art.” When I’m not actually painting I am thinking or reading about it, or going to museums and galleries, etc. I love to travel, cook, read, and go to movies. I also love the connections I’ve made, and use the strong friendships that I have for guidance and inspiration, support and comfort.